1. Open out the lamb if it has been tied with string and flatten it by bashing it a couple of times with a rolling pin. Put the oil, garlic, sliced lemon, maple syrup, ras el hanout, ketchup, rosemary and plenty of seasoning in a large freezer bag and stir to mix. Add the lamb and move it round the bag to rub the marinade into every bit of meat. Tie the bag and chill in the fridge for a minimum of two hours. 2. Light the barbecue. When the lamb is ready to cook, remove it from the marinade (keeping the bag for the courgettes) and lay skin-side down over the hot coals. Cook the lamb for 25-35 minutes, turning occasionally, until just pink in the middle. Remove from the barbecue and leave to rest on a warm plate loosely covered with foil while you cook the courgettes. 3. Cut the courgettes in half lengthways down the centre. Add to the marinade in the bag and rub all over to coat. Grill, with the lemon slices, on the barbecue for 4-5 minutes, turning until tender and nicely charred. 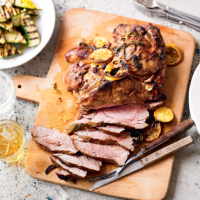 Cut into lengths and serve with the sliced lamb.